Very elongated, transparent and bright Wendwilsonite crystals. 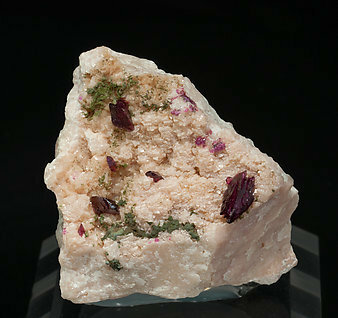 They have a very intense and uniform color and are on a rocky matrix partially coated by very acute, transparent, bright and slightly pinkish scalenohedral Calcite crystals. We'll send copy of the analysis to the buyer. 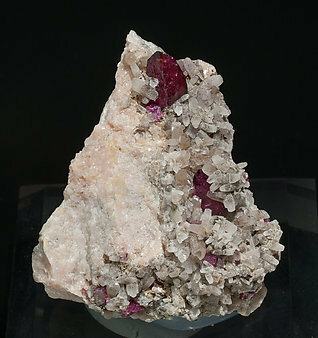 Very sharp, transparent and bright crystals, with a very intense and uniform color, on matrix, with small, very acute, scalenohedral Calcite crystals. This sample was found some years ago and it is different from the most recently collected samples. It has been analyzed and we will send a copy of this analysis to the buyer. Transparent and very bright Wendwilsonite crystals on a Calcite matrix partially coated by yellow small scalenohedral crystals. 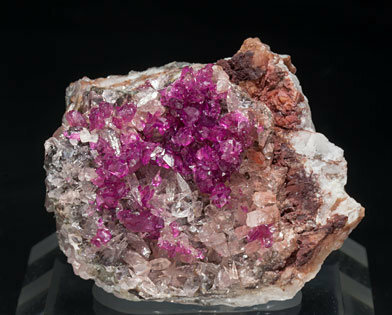 The Wendwilsonite crystals have a deep mauve color, and have polycrystalline growths and curved faces and edges. The analysis of the sample shows that it is very pure Wendwilsonite. We will send a copy of the analysis to the buyer. Transparent and very bright Wendwilsonite crystals on a Calcite matrix partially coated by aggregates of small green Cobaltaustinite crystals. 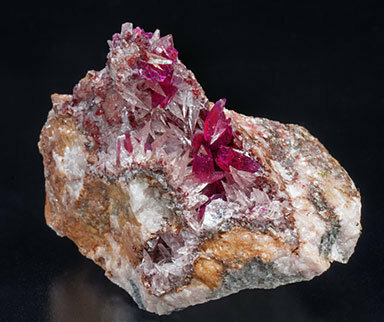 The Wendwilsonite crystals have a deep mauve color, and have polycrystalline growths and curved faces and edges. The analysis of the sample shows that it is very pure Wendwilsonite. We will send a copy of the analysis to the buyer.